For 50 years, SAGE has been at the forefront of research and scholarship in the fields of business and management, publishing the work of leading minds in groundbreaking textbooks, highly influential journals, and must-have reference materials across the curriculum. Known for our quality content and cutting-edge, innovative resources, instructors, students, researchers, and professionals alike trust us to provide the tools they need to thrive in today’s dynamic business environment. 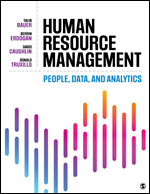 Human Resource Management: People, Data, and Analytics introduces students to the fundamentals of talent management with integrated coverage of data analytics. Features tied to SHRM competencies and data exercises give students hands-on opportunities to practice the analytical and decision-making skills they need to excel in today’s job market. 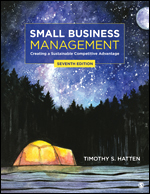 Timothy S. Hatten’s Small Business Management: Creating a Sustainable Competitive Advantage, Seventh Edition equips students with the tools they need to navigate the important financial, legal, marketing, managerial, and operational decisions to help them create and maintain a sustainable competitive advantage in small business. Strong emphasis is placed on application with Experiential Learning Activities and application of technology and social media throughout. Ranked* 1st in Applied Psychology, 2nd in Business and 3rd in Management! 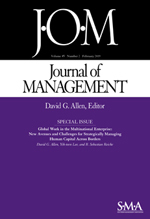 Journal of Management (JOM) publishes scholarly empirical and theoretical research articles that have a high impact on the management field as a whole. Articles cover a wide range of key topics, including: business strategy & policy, organizational behavior, human resource management, organizational theory, entrepreneurship, and research methods. See the table of contents NOW!